The GDS-1000A is one of the few DSOs currently on the market that can provide complete remote control or data capture over an USB interface. The GDS-1000A Series also supports PictBridge, allowing you to print directly to your printer without complex configuration. After connecting to a PictBridge compatible printer with an USB cable, printing is as easy as pressing a button. MemoryPrime technology allows a maximum of 2M points of waveform data. For engineers, analyzing a considerable amount of data can be an extremely challenging task. To assist engineers to analyze waveforms quicklier, we provide Horizontal Page Skip and Set Time Mark functionalities, letting engineers take full advantage of the 2M memory depth. A built-in Autoset function on a digital oscilloscope gives engineers remarkable convenience. With the complexities of product features, traditional auto measurement information is inadequate for modern measurement needs. The new Cursor Gating feature allows you to mark an area with cursors for auto measurement. There is a diverse range of test probes currently on the market such as passive, differential, and electrical probes. The attenuation ratio of each probe type also differs greatly. To ensure compatibility, probe attenuation ratios of 0.1X to 2000X as well as voltage and current probes are supported by the GDS-1000A. 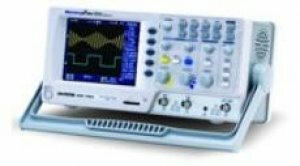 What is the single feature lacking from most digital storage oscilloscopes? Adequate memory depth. Is the memory depth of your DSO large enough? With 2M points of memory, the GDS-1000A has the capability to acquire far more waveform data compared to other DSOs in the same performance range. The 1GSa/s sampling rate and 2M point memory play an extremely powerful role for single-shot waveform capture. Properly set the trigger conditions to baby-sit the expected waveform. When the single-shot waveform is triggered and captured, you are able to check and see the single-shot event without losing any detailed information. A DSO, with high sampling rate but short memory, can't do the job of single-shot waveform capture as well as GDS-1000A can. Full-featured acquisition mode and 27 auto measurement functions help users to measure the parameters of captured waveforms accurately. The advanced Auto-Set function enables GDS-1000 Series to catch waveform automatically and display waveform quickly. With Arithmetic functions, +, -, x and FFT, GDS-1000A Series keep users aware of the measurement results by updating values immediately. Without almost extra calculation, GDS-1000A can provide sufficient information of testing. For the convenience of waveform observation and analysis, the GDS-1000A includes Delay On/Off functions usually available only in the higher end products. With Delay On, a signal can be observed from an offset of the trigger point. This feature allows the horizontal scale and the waveform scale to be expanded and centered on the delay point rather than the trigger point, allowing a signal to be observed in detail where needed. In a DSO, "AC Coupling" is normally used to isolate the AC components of a signal by blocking the DC components. This is useful to see a signal with a small AC component that is offset with a large DC voltage. With AC coupling to block the DC voltage, small AC waveforms can be observed from the center of the screen for measurement or examination. However, capacitive loading under AC coupling mode may cause waveform distortion as low frequency components become degraded, an effect that needs to be avoided in frequency critical applications. The Expand by Ground and Center functions are convenient tools to expand a waveform vertically. With this feature, the vertical scale of a waveform can be expanded either from the ground reference or from the center of the screen without causing capacitive loading. The FFT math function on a digital storage oscilloscope is often used to observe the fundamental and harmonic components of a signal. Typically the traditional unit of the FFT is a decibel (dB). However in the use of dB, it is difficult to identify the fundamental frequency of a signal from a noisy spectrum sometimes. With the FFTrms function, the GDS-1000A series can clearly display the fundamental frequency of an acquired waveform. Using a USB port coupled with FreeWave remote monitoring software is the easiest and most convenient way to capture data from the GDS-1000A. With FreeWave, a screenshot can be saved as an image file (.bmp/.jpg), waveform data(.csv) can be logged, and movie files(.wmv) can be recorded in real-time. Not only can FreeWave monitor and record waveforms over a long period of time, but previously recorded waveforms can also be observed. Instrument settings can even be configured without the need to learn incomp rehensible command line syntax. With the simple user interface and robust features, FreeWave allows you to get the most out of the GDS-1000A with little effort. With the Microsoft Excel or Word Add-ins, you only need to click the Add-in icon to import your test data, saving you time and effort from the action of copying and pasting data into documents. By providing the Global Lifetime Warranty Program for the GDS-1000A digital storage oscilloscope series, we believe you can have the same confidence as we do in the quality of each GDS-1000A DSO. By purchasing a GDS-1000A you can be assured of a highly economical, low maintenance, quality DSO backed with the protection of the LifeTime Warranty program. The Lifetime Warranty Program guarantees customers will be supported regardless of their location. Customers will receive at least 5 years of full support even after production has ceased. For more details and applicable conditions regarding the LifeTime Service program, please visit the GW Instek website www.gwinstek.com/llw or consult your nearest distributor.